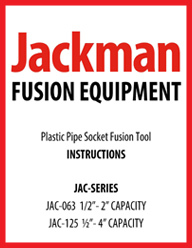 Jackman Fusion JAC-063 is a Manual Socket Fusion Welder for welding Socket Fusion style fittings in various materials including, HDPE, MDPE, PPR, PP, and PVDF. The welder is composed of a heating plate, digital temperature control display screen, and a comfortable nylon plastic handle shell. Digital Adjustable Temperature Regulator (Factory Set at 500 Degree F). 110/120 Volt Power. 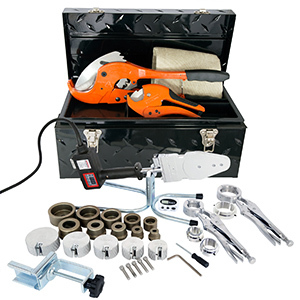 The JAC-063 IPS Complete Set provides you with the JAC-063 Welder along with all the tools and supplies you need to weld 3/4" IPS to 2" IPS. This set is equipped with everything you need to weld 3/4" IPS - 2" IPS, However The JAC-063 has a welding size range as listed below. Perfect for all Geothermal, Irrigation, Water and Gas Line Contractors! Click the button below to add the Jackman Socket Fusion Welder Complete Set 3/4" IPS - 2" IPS to your wish list.